who is ill with cancer. which he composed like a personal journal. At one point he confesses that he feels resentful. because she is so ill.
because she is so young. something he wants to do. Still, he writes, “Who’s taking care of me? and I have to go work a full day? Brendan’s questions are valid and make real sense. should feel ashamed for asking. and those needs are individualized. wherever that support comes from. which is at least a beginning. 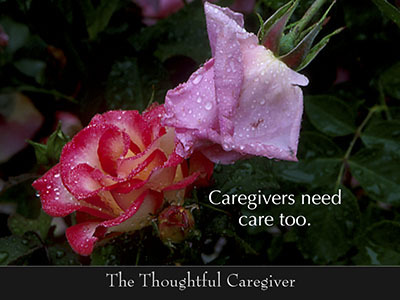 This entry was posted on August 17, 2007 at 5:37 am and is filed under Caregiver Truths, Caregiving & Feelings, Validation. You can follow any responses to this entry through the RSS 2.0 feed. You can leave a response, or trackback from your own site.